Boston College will play host to ESPN College Gameday on Saturday, the show’s first visit to Chestnut Hill, MA since 2009. The #22 Eagles host #2 Clemson in a de facto ACC Atlantic championship game. Clemson comes in 6-0 in conference play and Boston College is 4-1, with one ACC game to go after this. The winner will be in a position to face one of Pittsburgh, Virginia, or some other unlikely team from the Coastal division in the ACC title game. Boston College has not had a ton of success vs Clemson as of late, losing 7 straight dating back to 2011. Clemson is 16-9 all- time vs the Eagles. The last time Boston College won was in 2010. That season was also the last time that Clemson finished with both a losing record (6-7) and did not win 10 or more games. That Boston College team included 2011 first round pick Anthony Castonzo at LT, 2012 first round pick Luke Keuchly at linebacker, and RB Andre Williams, who would finish fourth in Heisman Trophy voting in 2013, was a first team All-American, and won the Doak Walker Award, given to the top running back in the nation. Williams was a 2014 fourth round draft pick and had a pretty uneventful NFL career. Clemson freshman WR Deandre Hopkins had one catch (for 22 yards) from QB Kyle Parker. As mentioned, a win Saturday night could vault BC into the ACC title game, which would be their first time playing in the game since back-to-back appearances in 2007 and 2008. In each of those years, they would lose to Virginia Tech and the Hokies would go on to appear in the Orange Bowl, representing the ACC. The Eagles only conference title came back in 2004 when they were in the Big East. Falcons QB Matt Ryan started for the 2007 team and threw for over 4,500 yards that season, 31 TD and 19 INT. He was a first team All-American and ACC Player of the Year, amongst other awards. Boston College does not have a major NFL pressence at the moment. In addition to Matt Ryan, here are the top BC NFL players. In case you didn’t know, Boston College is coached by Steve Adazzio, who has been there since 2013. Adazzio previously spent two years as the Temple head coach and was an offensive assistant coach for Florida during the Tim Tebow/Urban Meyer years. 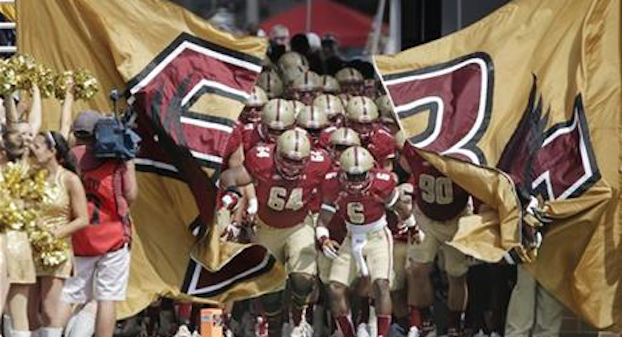 Does Boston College have a chance to pull off the upset on Saturday?